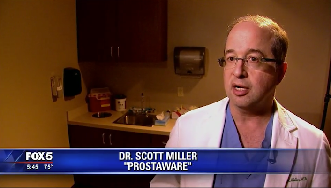 Dr. Scott Miller was recently featured on Fox 5 Atlanta discussing the importance of PSA prostate cancer screenings alongside his patient, Karl Lutz. During an annual physical two years ago, Lutz’s physician suggested he undergo a PSA test to screen for prostate cancer. The test revealed that he had elevated PSA levels, a key indicator of prostate cancer, and follow-up examinations confirmed the diagnosis. Fortunately, the cancer was caught early and Lutz was an ideal candidate for minimally invasive, robot-assisted surgery to remove the prostate gland. Learn more about Karl Lutz’s story and hear more of Dr. Miller’s recommendations about screening for prostate cancer below or by clicking here!